Offering you a complete choice of products which include stainless steel board, display stands, lobby stand, menu stand, ss display counters and cantilever sign boards. Keddy Concept is amongst one of the consistent business enterprises affianced in the domain of providing to our clients an extensive collection of Stainless Steel Board. These provided products are extensively commended and applauded owing to their flawless finish, high performance and reliability. 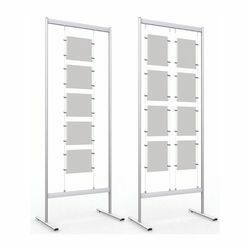 Keddy Concept is the Leading manufacturer & supplier of Display Stands. From a functional perspective, a display should focus on the consumer's wish to purchase goods and should grab the attention, interest, desire, memory, and a series of mental activities. 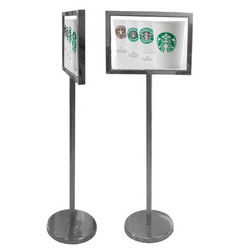 In addition to color, text, graphics, and other elements of Interior design, the display stand embodies the use of POP Advertising functions. A display of goods must be met to convey information and the sales functions of goods and should have a personal style and structure design. Keddy Concept is engaged in offering our clients a wide range of quality Lobby Stands. These are fabricated using quality raw material. These can be availed at affordable prices. Keddy Concept is the leading manufacturer of Menu Stand. What makes the menu stand critical to the success of a restaurant, bar, or concession stand? 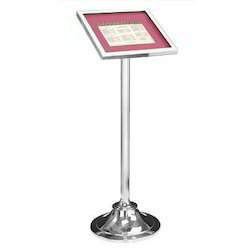 The answer is that a Menu stand captures potential customers that pass by, enticing them with a list of an institution's specials! The right menu stand can draw an immense amount of patronage into a restaurant. Clients can avail from us an array of SS Display Counters, which is manufactured using quality material like stainless steel and hard glass. These SS Display Counters consist of many shelves and counters for keeping various eatables. 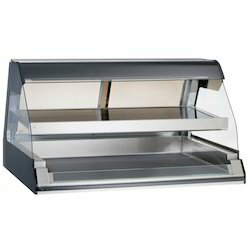 Our range of SS Display Counters is highly demanded in the restaurants, cafeterias, and hotels. We offer our customers standard and custom built sizes of these Display Counters. We offer these SS Display Counters at most affordable prices to our precious customers. We are manufacturer of cantilevers boards, road cross boards, indication boards, highways boards, traffic signs, road blocked signages, and many more type of boards. I am expertise in manufacturer the different qualities sign board, nameplates, Brass and Steel name plates, MS MRF Powder coating box type letters, flat numbers, Brass Engraving and Etching plates. You will find the most reasonable and attractive price compare to market. Apart from that we provide immediate delivery and guaranteed work. 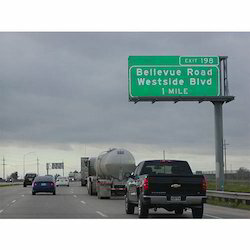 We specialize in manufacturing, exporting and supplying broad range of Road Safety Sign. The offered safety sign is for the safety of the roads to avoid hap hazards and accidents. Also, offered safety sign is passed through a series of testing procedures for ensuring its overall quality. This safety sign is available in various sizes from us as per the need of customers. We are instrumental in offering finest quality Gantry Sign Board to our prestigious clients. The offered board is designed using quality tested raw material and modern technology under the vigilance of skilled professionals. We offer this board in diversified sizes and designs for our customers to choose from. In addition to this, our provided board is tested on different parameters by our quality controllers. 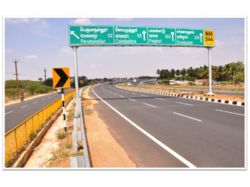 Product Description: With enriched industrial experience and knowledge, we are providing an excellent range of Highway Toll Plaza Signage Board. 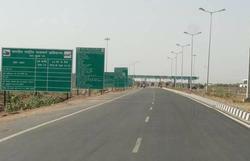 Widely used at toll plazas, the offered boards are used in highways to give directions and indications to the driver. In addition to this, our offered boards are quality checked under the supervision of quality controllers, in order to ensure their flawlessness.